Jovian (Latin: Flavius Iovianus Augustus; 331 – 17 February 364) was Roman Emperor from 363 to 364. 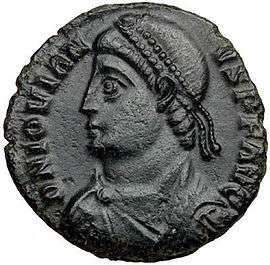 Upon the death of emperor Julian the Apostate during his campaign against the Sassanid Empire, Jovian was hastily declared emperor by his soldiers. He sought peace with the Persians on humiliating terms and reestablished Christianity as the state church. His reign lasted only eight months. Jovian was born at Singidunum (today Belgrade in Serbia) in 331 AD, the son of Varronianus, the commander of Constantius II's imperial bodyguards (comes domesticorum). He also joined the guards and by 363 had risen to the same command that his father had once held. In this capacity, Jovian accompanied the Roman Emperor Julian on the Mesopotamian campaign of the same year against Shapur II, the Sassanid king. After the Battle of Samarra, a small but decisive engagement, the Roman army was forced to retreat from the numerically superior Persian force. Julian, mortally wounded during the retreat, died on 26 June 363. The next day, after the aged Saturninius Secundus Salutius, praetorian prefect of the Orient, had declined the purple, the choice of the army fell upon Jovian. His election caused considerable surprise: Ammianus Marcellinus suggests that he was wrongly identified with another Jovianus, chief notary (primicerius notariorum), whose name also had been put forward, or that during the acclamations the soldiers mistook the name Jovianus for Julianus, and imagined that the latter had recovered from his illness. Jovian, a Christian, reestablished Christianity as the state church, ending the brief revival of paganism under his predecessor. Upon arriving at Antioch, he revoked the edicts of Julian against Christians. The Labarum of Constantine the Great again became the standard of the army. He issued an edict of toleration, to the effect that, while the exercise of magical rites would be punished, his subjects should enjoy full liberty of conscience. In 363, however, he issued an edict ordering the Library of Antioch to be burnt down, and another on 11 September subjecting those who worshiped ancestral gods to the death penalty. He extended the same punishment on 23 December to participation in any pagan ceremony (even private ones). Jovian entertained a great regard for Athanasius, whom he reinstated on the archiepiscopal throne, desiring him to draw up a statement of the orthodox faith. In Syriac literature, Jovian became the hero of a Christian romance. From Jovian's reign until the 15th century Christianity remained the dominant religion of both the Western and Eastern Roman Empires, until the Fall of Constantinople to the Turks in 1453. Jovian continued the retreat begun by Julian. Though harassed by the Persians, the army succeeded in reaching the banks of the Tigris. There, deep inside Sassanid territory, he was forced to sue for a peace treaty on humiliating terms. In exchange for his safety, he agreed to withdraw from the five Roman provinces east of the Tigris conquered by Galerius in 298, that Diocletian had annexed, and to allow the Persians to occupy the fortresses of Nisibis, Castra Maurorum and Singara. The Romans also surrendered their interests in the Kingdom of Armenia to the Persians. The Christian king of Armenia, Arsaces II (Arshak II), was to stay neutral in future conflicts between the two empires and was forced to cede part of his kingdom to Shapur. The treaty was widely seen as a disgrace and Jovian rapidly lost popularity. After arriving at Antioch, Jovian decided to rush to Constantinople to consolidate his political position there. While en route, he was found dead in bed in his tent at Dadastana, halfway between Ancyra and Nicaea. His death has been attributed to either a surfeit of mushrooms or the poisonous carbon monoxide fumes of a charcoal warming fire. Jovian was buried in the Church of the Holy Apostles in Constantinople. This article incorporates text from a publication now in the public domain: Chisholm, Hugh, ed. (1911). "Jovian". Encyclopædia Britannica. 15 (11th ed.). Cambridge University Press. p. 526.